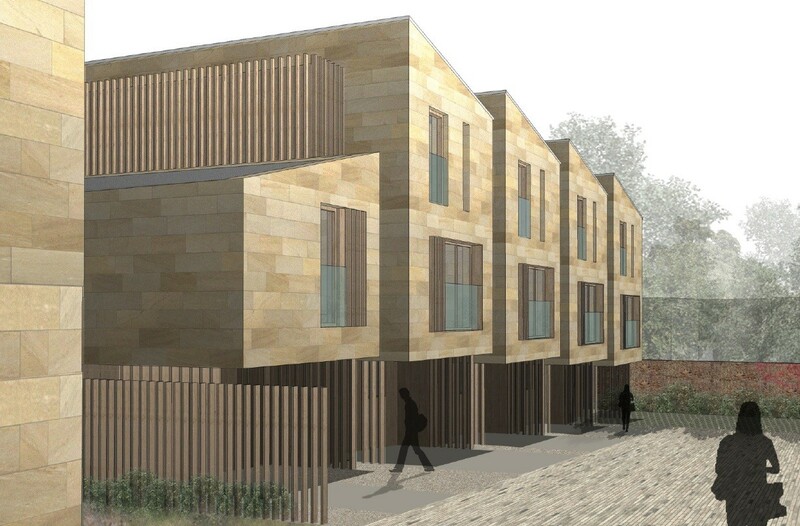 Lynsay Bell Architecture has put forward an infill housing project of six homes in Morningside, Edinburgh, on behalf of Thistle Property Group. 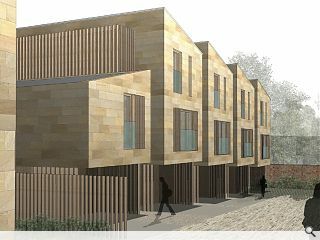 Replacing an existing garage on Jordan Lane the scheme will be finished in buff ashlar natural stone to marry with the conservation area with natural finish timber cladding used for the ground floor in the form of wide vertical cladding boards. Timber fins and slatted panels are also introduced over windows and to form boundary treatments, all of which will be thermally modified to allow it to weather naturally. In a statement the architects observed: “None of the existing buildings within the application boundary are worthy of retention and are built over a sewer main which would not be permitted as a new development. Views to Blackford Hills and the Pentlands beyond are retained by maintaining a driveway to the bottom of the site which could also be used as maintenance access to the sewer main. Very nice, tasteful and good choice of materials. Will add to the lovely area around it something a bit different but in a complimentary way.